The Yungdrung Bon syllable ‘OM’ has five parts. The meaning and symbolic color of each of these five parts depends upon the specific practice being done. These five parts can variously represent the Five Wisdoms, the Five Enlightened Bodies and the manifested deities of the five directions. 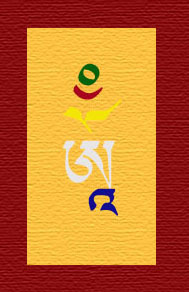 Here, the color of each of these five parts is according to the practice of the great mantra, OM MA TRI MU YE SA LE DU. Posted on August 10, 2014, in Uncategorized, Yungdrung Bon Sacred Symbols. Bookmark the permalink. Leave a comment.